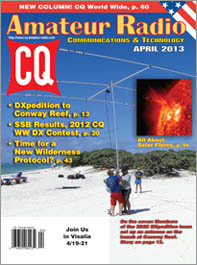 The April issue of CQ features our first major move in the realignment of our contest reporting, moving up by four months the SSB results of the 2012 CQ World Wide DX Contest. 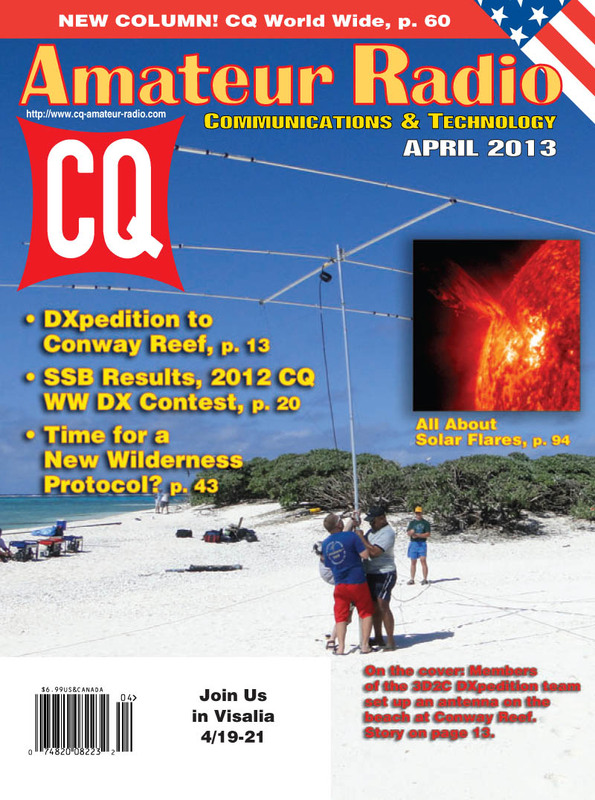 But we get started with our cover story on the 3D2C DXpedition to Conway Reef in the South Pacific. Team member David Flack, AH6HY, writes about not only the ham radio operations but about the wildlife with which the team shared the island. The CQ World Wide DX Contest once again drew a record number of logs for both the SSB and CW weekends (CW results next month), even with the shortened time window for log submissions to help speed results reporting. On the SSB weekend, nearly 8200 logs were received, from 237 different DX entities. Winners included CN2R (op. W7EJ), TO2A (N6KT), KR2Q, P4BT (W5AJ), PX5E (PP5JR), GM5X (GM4YXI), 9Y4D, YT8A, EB3CW, 3V8CB (YT1AD), D4C, PJ4X and C5A. On the topic of competition, the April issue also includes the rules for this year's CQ World Wide Foxhunting Weekend. Since this is April, we have our annual visit from Professor Emil Hiesseluft, who reports on signs of intelligent life detected by the Lauton Institute's Center for Research on Alien Populations. In the same spirit, "Math's Notes" editor Irwin Math, WA2NDM, looks into Ultra-Low-Frequency communications, and "Magic in the Sky" editor Jeff Reinhardt, AA6JR, writes about Color Radio and Smellovision. "Riley's Ramblings" editor Riley Hollingsworth, K4ZDH, examines repeater coordination, calling CQ and what secondary allocations are all about, along with a report on the FCC's field hearing on lessons learned from superstorm Sandy - including a request from an FCC commissioner for hams to file written comments in the proceeding. Public Service Editor Richard Fisher, KI6SN, hands over the pen this month to Mike Pulley, WB4ZKA, who has a commentary suggesting that it's time to re-examine the Wilderness Protocol for getting help if needed in the backcountry. 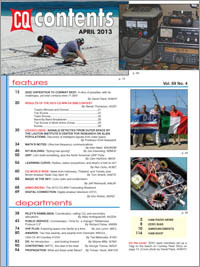 Kit-Building Editor Joe Eisenberg, K0NEB, offers suggestions for springtime construction projects; QRP Editor Cam Hartford, N6GA, is also in a building mood this month, and new "Learning Curve" editor Ron Ochu, KO0Z, looks at what you should look at in deciding on your first radio. 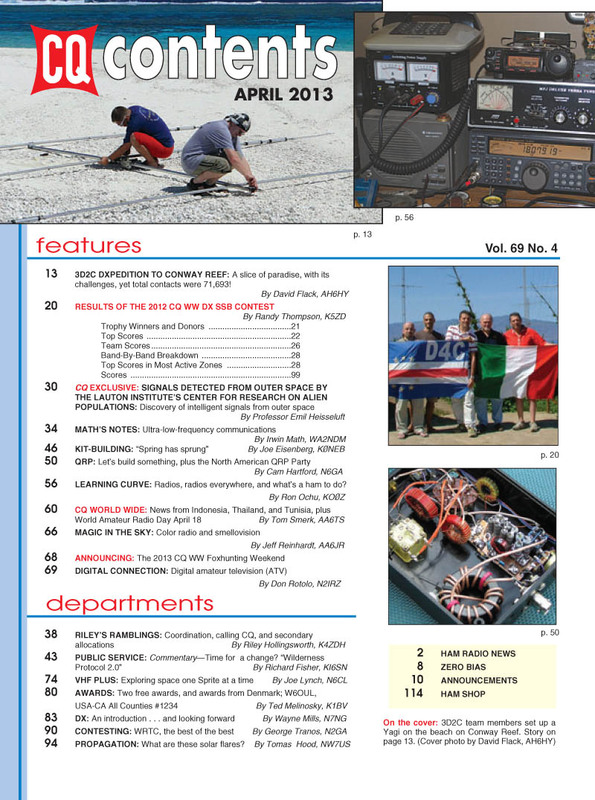 We also introduce a brand-new column in this issue, "CQ World Wide," in which column editor Tom Smerk, AA6TS, will look at ham radio news and activities from around the world. Digital Editor Don Rotolo, N2IRZ, examines the reasons that digital amateur television has been slow to catch on; VHF Editor Joe Lynch, N6CL, reports on a fascinating new concept in mini-satellites, so-called "sprites" that are about two inches square and designed to be launched by the hundreds or even thousands; and Awards Editor Ted Melinosky, K1BV, covers awards from Denmark plus two awards that share the distinction of being … free! Our new DX Editor, Wayne Mills, N7NG, introduces himself and his plans for the column going forward; Contesting Editor George Tranos, N2GA, looks at "the best of the best" competing in the World Radio Teamsport Championship, or WRTC; and Propagation Editor Tomas Hood, NW7US, takes us behind the scenes in a solar flare. That's a brief look at what's coming up in the April issue of CQ magazine, which should be on newsstands and in subscribers' mailboxes by the end of March or beginning of April, and available to digital edition subscribers by April 1. For information on becoming a CQ subscriber, click here! Zero Bias - "In Case You Were Wondering . . ."